Independent candidate Eliot Cutler's proposals include an open primary or adoption of ranked choice voting. Electoral reforms surfaced as an issue in the gubernatorial election campaigns Thursday, as independent Eliot Cutler released a proposal for sweeping changes that was quickly criticized by some Democrats and by Republican Gov. Paul LePage. Cutler, whose donors won a court case last week allowing them to give his campaign more money, held a press conference to propose sweeping changes designed to break the dominance of two-party politics and special interest money in elections. One proposed reform would ensure that voters elect a governor by a majority vote by either adopting an open primary in September, where unenrolled voters could cast ballots and the top two vote-getters, regardless of party, would proceed to the general election; or by adopting ranked choice voting, in which voters rank the candidates in order of preference. He also called for the elimination of so-called leadership political action committees and for setting limits on campaign fundraising by lobbyists. The reforms, some of which have already been proposed unsuccessfully to the Legislature, come a day after the state ethics board ruled that in the 2014 gubernatorial election, Cutler can raise as much money as the party candidates, LePage and Michaud. Prior to Wednesday’s ruling, donors to unenrolled, non-party candidates, who bypass primary elections, could only give $1,500, whereas donors to party candidates could give up to $3,000 – or $1,500 each for a primary and general election. Cutler, who lost the five-way gubernatorial election in 2010 by 2 percentage points, praised the commission’s decision, which he said made “one set of Maine’s discriminatory election rules history,” if only for 2014. “This is an important first step in reforming our political process. But I believe this ruling can and will create a tailwind for more reform,” he said. Michaud’s campaign said it is open to some of Cutler’s ideas, but some Democrats criticized him for not supporting those reforms when they were being debated in the Legislature. LePage’s campaign dismissed Cutler’s proposal, saying they it would reduce participation in elections. Wednesday’s ruling by the Commission on Governmental Ethics and Election Practices followed a ruling last Friday by U.S. District Judge D. Brock Hornby that granted a preliminary injunction allowing Cutler supporters to contribute a maximum of $3,000. Hornby’s action came in response to a complaint by four Cutler donors who challenged the law, saying it unfairly benefits major-party candidates. The section of campaign finance law in question had never been challenged in Maine. Before this year, there had never been an uncontested gubernatorial primary in the state, and the rules were designed to ensure that party candidates who participated in one had enough money to effectively run two campaigns – one for the primary election and another for the general contest. In voting Wednesday to raise the limit to $3,000 for Cutler, the state ethics board acknowledged that the increase also would benefit his opponents. Under the panel’s vote, Michaud and LePage can collect $3,000 contributions from individuals who gave no money during the primary campaign. Unenrolled voters make up the largest portion of the electorate. As of June 10, there were 352,547 unenrolled voters, compared to 306,828 Democrats and 261,415 Republicans, according to the Secretary or State’s office. 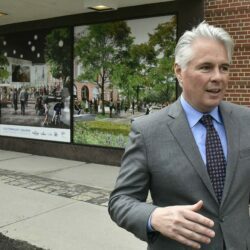 Cutler’s proposal for an open primary allowing all voters to participate would put all qualified candidates on a single ballot. The primary would be moved from June to September, and the top two vote-getters, regardless of party affiliation, would square off in a six-week general election, with one televised debate occurring every week. Cutler said he would seek to eliminate leadership PACs, which are funded by special interest groups and used by legislators to win leadership positions by supporting other candidates during elections. “These are distortive mechanisms essentially hidden from voters that skirt even the vestiges of Maine’s Clean Elections law that remain effective,” Cutler said. 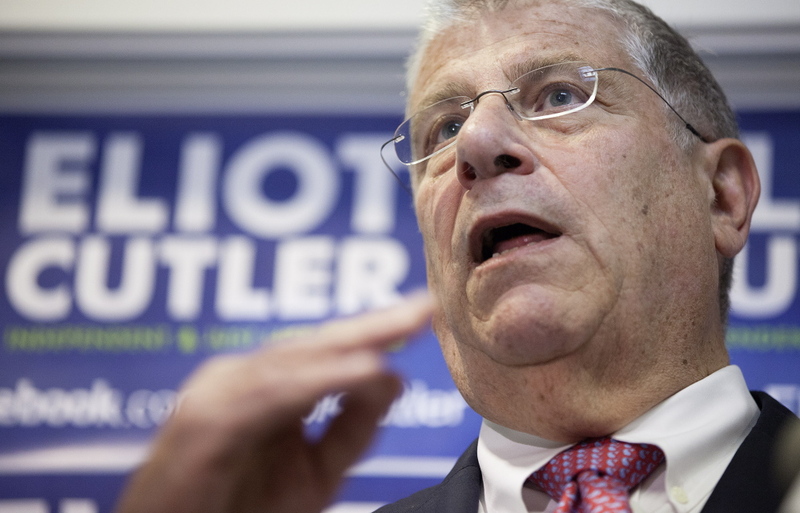 While Cutler has advocated for electoral reform since 2010, he has been criticized by Democrats for not doing more to advance those reforms at the legislative level, including ranked choice voting, which has been proposed several times. LePage, whose support has held steady at 38 percent or so, stands to benefit from this year’s three-way race, whereas Michaud, who holds a slight lead over LePage, could be hurt, especially if Cutler rises in the polls. LePage’s campaign spokesperson Alex Willette said Cutler’s reforms reduce dialogue and participation in elections. “Eliot’s announcement today is hardly different from what he has been wandering the state complaining about since his 2010 defeat,” Willette said. Michaud’s campaign spokeswoman, Lizzy Reinholt, said the six-term congressman also supports electoral reforms, including ranked-choice and runoff voting. He also opposes the U.S. Supreme Court’s Citizens United ruling, which opened the flood gates for outside spending in elections, she said. “Mike believes that we need to take a comprehensive approach to reforming our electoral system to reduce the influence of money in politics and make it as easy as possible for people to make their voices heard through the voting process,” Reinholt said.